needs to measure their blood glucose levels daily? 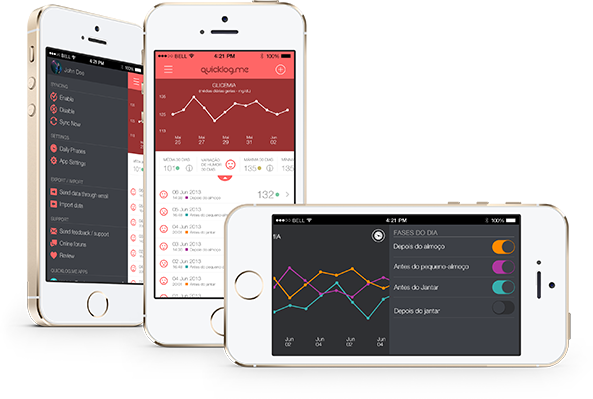 The Glycemia Tracker Quicklog.me is an app that lets you record blood glucose levels or blood sugar concentration (in mg/dL or mmol/L) throughout the day, take notes and even record the reference values recommended by your doctor. Synchronize your data between different iOS devices. This way, your data can, for example, be added on the iPhone and viewed on the iPad. The glucose values added at different times of the day, previously defined by the user, are introduced and represented by graphs, which allow a better perception of blood glucose levels. Each person has different needs. The Glycemia Tracker allows you to set different moments of the day, to which you can associate the same daily recording time, as well as a maximum and minimum reference value. Allows you to set alarms, in order to measure your levels of glucose, alert you to make a doctor's appointment, as well as attach a note to any alarm. Send your data to your doctor/nurse and make regular backups by exporting the data via email, preventing its loss.